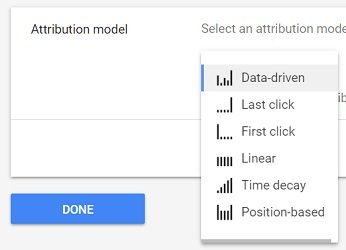 Why Should You Use Attribution Modelling in Google Ads? Attribution modelling is a very broad topic. 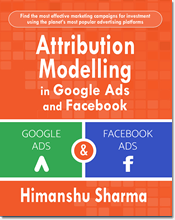 This article talks only about understanding and using attribution modelling in the context of Google Ads. 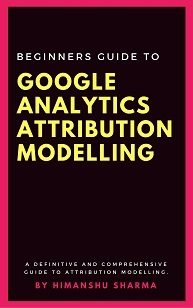 To understand the very basics of attribution modelling and how it works in Google Analytics, check out this article: Beginners Guide to Google Analytics Attribution Modelling. If you have not already read this article then I would highly recommend that you read it. 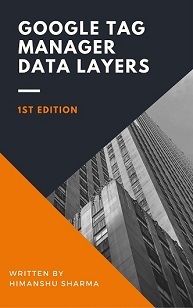 It is a good starter guide to understand the various aspects of attribution modelling and can help you greatly in understanding the present article. Why You Should Use Attribution Modelling in Google Ads? 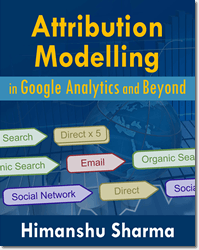 You should use attribution modelling in Google ads to understand the role of various keywords, ad groups and campaigns in initiating, assisting and completing conversions. Through attribution modelling you can understand how users search for your products and what they do before they make a purchase. The biggest insight that you can get from attribution modelling is that you can determine the most effective keywords, ad groups and campaigns for investment. Note: Attribution modelling in Google Ads is available only for clicks on Search Network ads and Shopping ads on google.com. It is not available for interactions with Display Network ads. The advent of attribution modelling has fundamentally changed the way we look at the data for good. Up to now we have been managing PPC campaigns by bidding on ‘last ad click keywords’ (keywords which completed the sales). This has to change because it is sub-optimal way of optimizing a campaign. To get optimum results, you also need to invest in keywords which initiated or assisted in sales. Different keywords (first ad click keywords, middle ad click keywords and last ad click keywords) work together to create a sale. Yet we remain focus only on the last click keywords. It is quite common for users to refine their search queries (on search engines like google.com) to get the product they are looking for. And it is also quite common for users to return to a website via a branded keyword (as it is easy to remember) before making a purchase. 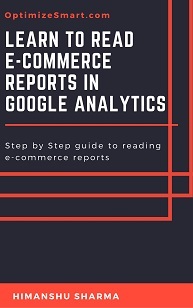 Since by default, Google Analytics attributes conversions to the last non-direct clicks, branded keywords end up getting tons of undue credit for sales. Consequently branded keywords campaigns seem to perform so well in PPC. But these campaigns are still not producing optimum results because our whole optimization efforts are directed towards last click keywords and we now know, that different keywords work together to create a sale. If you keep adding more of one unit of production to a productive process while keeping all others units constant, you will at some point produce lower per unit returns. This is known as the law of diminishing returns. 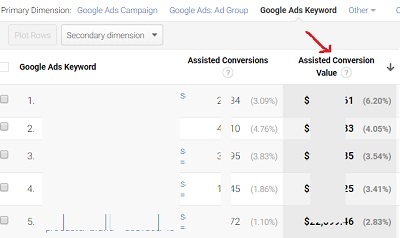 So in the case of PPC, if you keep optimizing for last click keywords (in our case branded keywords) while ignoring first and middle clicks keywords (collectively known as assist keywords) you will at some point produce lower per unit returns. What that means, your cost per acquisition at some point will start rising and your profit on sales will start declining. Then the only way, to remain within your CPA targets is by tweaking (add, pause, delete, change bids) last click keywords. But this is sub-optimal way of optimizing a PPC campaign, as you are optimizing only the bottom part of the conversion funnel. In order to strengthen your PPC campaigns, you also need to bid on keywords and search queries that initiated and assisted conversions (conversion actions). In this way you can stay away from the point of diminishing returns and remain within your CPA targets much longer. High performing conversion assisters (i.e. the top keywords/search queries which assisted conversions). 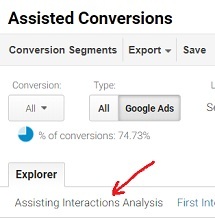 Step-1: Navigate to ‘Assisted Conversions Report’ (‘Conversions’ > ‘Multi Channel Funnels’) in your main Google Analytics view. Step-8: Compare all the high performing assisting keywords against the keywords you are currently bidding on in your PPC campaigns. Add the keywords which are missing, to your PPC campaigns and then bid on them. Step-10: Compare all the high performing assisting search queries against the keywords you are currently bidding on in your PPC campaigns. Add the search queries which are missing (as keywords), to your PPC campaigns and then bid on them. Step-13: Compare all the high performing conversion initiator search queries against the keywords you are currently bidding on in your PPC campaigns. Add the search queries which are missing (as keywords), to your PPC campaigns and then bid on them. Step-15: Compare all the high performing conversion initiator keywords against the keywords you are currently bidding on in your PPC campaigns. Add the keywords which are missing, to your PPC campaigns and then bid on them. It is the ‘cost per last ad click conversion’. 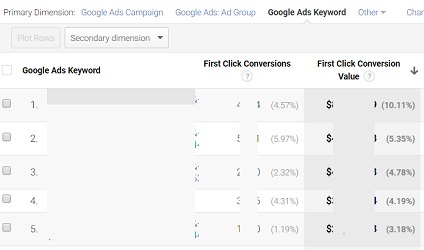 So if you ignore first and middle click keywords and optimize PPC campaigns on the basis of ‘cost per last ad click’ conversions then you won’t get optimal results and may even lose money. That is because if a keyword is not completing a sale, it may be initiating a sale or assisting a sale (always remember that). 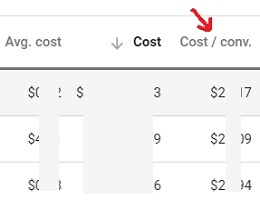 And if you stop bidding on the keyword because its ‘cost per last click ad conversion’ (the so called CPA reported by Google Ads) is too high or the keyword is not directly completing any conversion then you could lose money. Similarly the conversions reported by Google Ads are last ad click conversions. So if you overlook the role of prior keywords in the conversion process then you are missing the big picture. Every time your ad is served on Google Ads Networks (Google.com, YouTube, Partner websites and apps), it is counted as ‘Ad Impression’ by Google ads. It does not matter whether or not your ad was actually viewed by a user. As long as your ad is served on Google Ads Networks, each serving is counted as one ad impression. For example, if you ad was served 10 times on Google Ads Networks then the number of impressions counted for the ad would be 10. Measurable ad impressions is the number of times your ad could be measured for viewability. Non-Measurable ad impressions is the number of times your ad could not be measured for viewability. Viewable ad impressions is the number of times your ad was viewable. An ad is viewable when at least 50% of its area is visible for 1 second for Display Network ads or 2 seconds for video ads. Non-Viewable ad impressions is the number of times your ad was considered non-viewable. An ad is non-viewable when at least 50% of its area is not visible for 1 second for Display Network ads or 2 seconds for video ads. The event of clicking on an ad is called ad click. A user can not click on an ad without viewing it. So an ad click is always followed by one or more ad impressions. watched 30 seconds or less of your video ad. clicked on call to action overlay, cards or companion banner. clicked on the thumbnail for video discovery ads. Note: Video views do not include video ad impressions or thumbnail impressions for video discovery ads. view or click on a Showcase Shopping ad. Note: Ad engagement generally does not include: ad impressions, ad clicks and video views. An interaction is the main action associated with an ad format. 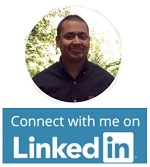 Interactions can include: ad clicks, ad engagement or video views. For ‘Search Campaigns‘, ad interactions include ad clicks. So if a search campaign has got 100 ad clicks in the last 30 days then Google will report 100 ‘ad interactions’. For ‘Display Campaigns‘, ad interactions can include both ad clicks and ad engagement. So if a display campaign has got 53 ad clicks and 27 ad engagements in the last 30 days then Google will report 80 ‘ad interactions’. For ‘Shopping Campaign‘, ad interactions can include both ad clicks and ad engagement. For ‘Video Campaigns‘, ad interactions include ‘video views’. So if a video campaign has got 100 views in the last 30 days then Google will report 100 ‘ad interactions’. Note(1): Ad interactions do not include ad impressions. Note(2): A video ad impression is different than a video view. In the context of Google Ads, conversions are called ‘conversion actions’. A conversion is a website goal or objective. In the context of Google Ads, there are four types of conversion actions. #1 Website Conversion Actions – the conversion actions recorded on your website (like purchase, leads, sign up, viewing of a key page etc). #2 App Conversion Actions – the conversion actions recorded on your mobile app (like mobile app installs, in-app actions like purchase). Calls to a phone number on your website. Clicks on a phone number on your mobile website. 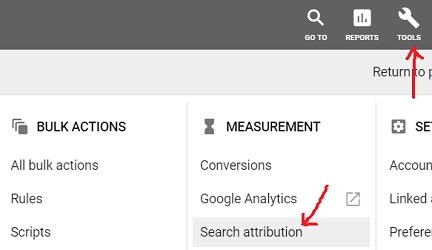 Note: Attribution modelling in Google Ads does not take app conversions and in-store conversions into account. A ‘click through conversion’ is counted when a user clicks on a Google ad and then complete a conversion on your website / mobile app. A ‘view through conversion’ is counted when a user completes a conversion on your website / mobile app after viewing (but not interacting) a Google display network ad or Google Video ad. A ‘Cross device conversion’ is counted when a user interacts with your ad on one device/browser but completes a conversion on another device/browser. 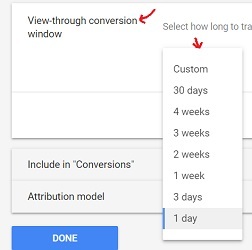 In the context of Google Ads Attribution Modelling, a conversion path is the sequence of ad interactions with your search network ads and/or shopping ads (on google.com) during the 30 to 90 days period that lead to a conversion action. It is important to note that, in the context of Google Ads attribution modelling, a conversion path is just made of ad clicks and/or ad impressions. The conversion path does not take the role of other marketing channels (like ‘organic search’, ‘social media’, ‘email’ etc) into account. 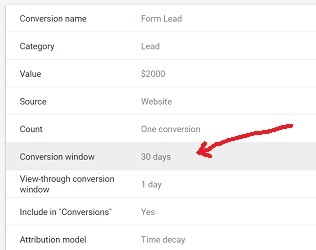 The period of 30 to 90 days prior to conversion action is called the ‘History Window’. The ad clicks and ad impressions which were recorded within the history window are considered for getting credit for a conversion action by Google ads. The History Window is available in almost all attribution modelling reports in Google Ads. Google ads refer to ‘History Window’ as ‘Conversion Window’ while setting up conversion actions. 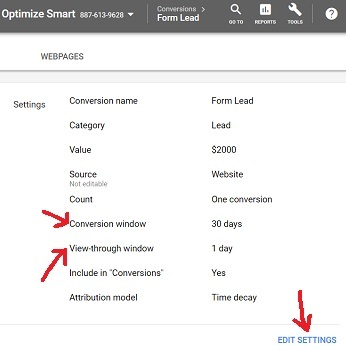 When you are creating or editing conversion actions in Google ads, you get the option to set the conversion window. #1 Click through Conversion Window (usually refer to as just ‘conversion window’). 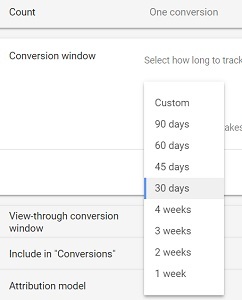 Click through conversion window refer to the time period within which, an ad click is considered for getting credit for a conversion action by Google Ads. View through conversion window refer to the time period within which, an ad impression is considered for getting credit for a conversion action by Google Ads. An attribution model is a set of rules that determine how the credit for conversions should be attributed to various keywords, ad groups and campaigns in Google Ads. Rule Based Attribution models assign conversion credits to ad clicks based on some predefined rules. 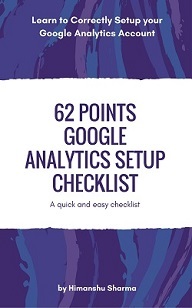 Algorithmic attribution models assign conversion credits to ad clicks based on an algorithm. The ‘Data Driven Attribution Model’ is an algorithmic attribution model offered by Google Ads. This attribution model gives all the credit for conversion to the last clicked ad and corresponding keyword. 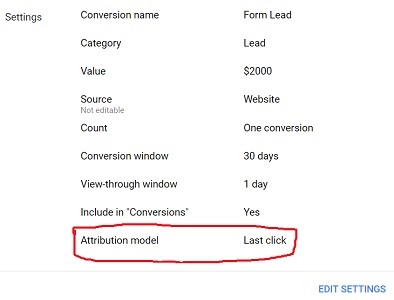 The default attribution model used by Google Ads is the ‘Last click’ model. So by default the last clicked ad (and corresponding keyword) in a conversion path gets all the credit for conversion in Google Ads. Use this model, if least amount of buying consideration is involved. For example, if you are a FMCG (fast moving consumer goods) company like ‘Tesco’ / walmart and you sell products which involves the least amount of consideration by a buyer (like purchasing toothpaste), then you can use the last click attribution model. This is because you do not need to assign more conversion credit to the first and middle interactions in your conversion path. This attribution model gives all the credit for conversion to the first clicked ad and corresponding keyword. In other words, the first clicked ad (and corresponding keyword) in a conversion path gets all the credit for conversion. Use the first click model, if brand building/brand awareness is very important for you. So you may need to assign more conversion credit to ad clicks, which initiated the conversion process. In that case you use the First click attribution model. This attribution model gives equal credit for conversion to all the ad clicks in a conversion path. In that case, use the linear model. This attribution model gives more credit to the ad clicks that happened closer in time to the conversion. The conversion credit is distributed using a 7 day half life. What that means, the ad click which is recorded 8 days before a conversion, gets half as much credit as the ad click recorded 1 day before the conversion. If you want to understand the buying behavior of your customers during a promotional campaign then you would want to assign more credits to the ad clicks which occurred closest in time to conversions ,as they are more relevant than the ad clicks which occurred further in the past. This attribution model gives 40% conversion credit to first clicked ad (and corresponding keyword) and 40% conversion credit to last clicked ad (and corresponding keyword). The remaining 20% conversion credit is equally distributed among all other ad clicks in a conversion path. If you have a business model or advertising objectives, which value first and last customer interactions more than the middle interactions, then use the Position based attribution model. The data driven attribution model uses a predictive algorithm (algorithm used to predict the users’ probability of making a purchase or completing some other conversion) to assign or reassign conversion credit to various ‘ad interactions’ in a conversion path according to the most recent conversion data. It is a conversion probability model. It does not distribute conversion credit just on the basis of ad interactions’ position. In other words ‘data driven attribution model’ is not a rule/position based model. 15000 or more ad clicks each month on Google Search. 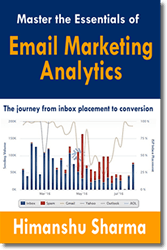 600 or more conversion actions each month. Let us suppose you own a business based which provides ‘car insurance’. Let us also suppose that you run Google Ads to advertise your business. A prospect find your website for the first time by clicking on your ad which was triggered for the keyword ‘car insurance UK’. He did not make any purchase for some reason. The prospect later returned to your website by clicking on your ad which was triggered for the keyword ‘cheap car insurance’. He again did not make any purchase. The prospect later returned to your website for the third time by clicking on your ad which was triggered for the keyword ‘buy car insurance UK’. He again did not make any purchase. The prospect returned to your website once again by clicking on your ad which was triggered for the keyword ‘car insurance Southampton’. This time the prospect purchased car insurance on your website. Now under the “Last click attribution model”, the last keyword, “car insurance Southampton” would receive 100% of the credit for the conversion. Under the “First click attribution model”, the first keyword, “car insurance UK” would receive 100% of the credit for the conversion. Under the “Linear attribution model”, each keyword would receive equal credit (25% each) for the conversion. Under the ‘Time decay model’, the keyword “car insurance Southampton” would receive maximum credit for the conversion (as it was searched closest to the conversion) followed by the keyword ‘buy car insurance UK’, ‘cheap car insurance’ and ‘car insurance UK’. The keyword ‘car insurance UK’ would receive least credit for the conversion as it was searched farthest from the conversion. Under the “Position-based attribution model”, the keywords “car insurance UK” and “car insurance Southampton” would each receive 40% conversion credit, while “cheap car insurance” and “buy car insurance UK” keywords would each receive 10% conversion credit. Under the “Data driven attribution model”, each keyword would receive conversion credit according to their contribution in a conversion path. The keyword which assisted / influenced the conversion the most, gets the maximum credit for conversion, regardless of it being a first click , last click or middle click. All other keywords would get credit in proportion to their contribution in the conversion path. 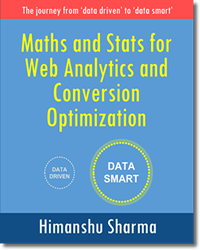 The conversion credits are assigned using a conversion probability model which uses a predictive algorithm. 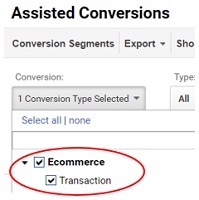 The attribution model that you select while editing/creating a conversion action tells Google ads, how to attribute conversions for the conversion action. Note: The attribution model that you select only affect the conversion action to which it is applied and it only affect your search network and shopping conversion data. The selected attribution model does not affect your Display network, Mobile App and phone call conversion data. 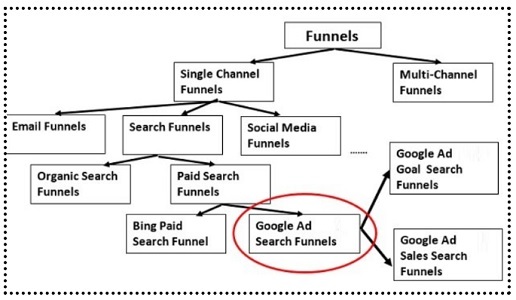 From the chart above we can conclude that Google Ads search funnel is a type of single channel paid search funnel. #1 Google Ads goal search funnel – it is a sequence of interactions ad clicks and ad impressions that lead up to a non-transactional goal. #2 Google Ads sales search funnel – it is a sequence of ad clicks and ad impressions that lead up to a transaction goal. Which Attribution Model to use in Google Ads (Adwords)?